We invite you to come & enjoy our elegantly fully funished apartments located on Dizengoff Street, in the heart of the ever exciting Tel-Aviv. Our properties are walking distance from the beach & nearby a wide variety of the very best cuisine, shopping centers and entertainment districts in Israel. 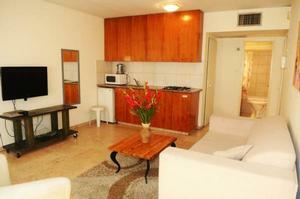 Dizengoff Beach Apartments is located on the north side of Dizengoff, across the famous port and beaches of Tel Aviv. 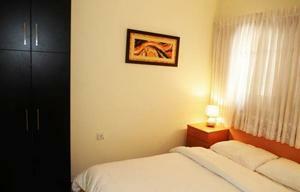 The apartments have one bedroom, with a separate living room with a pull out couch for 2 (sleeps up to five). Fully furnished kitchenette (microwave, gas stove, kettle, mini refrigerator), central AC/heating, cable TV, free wireless internet, linens and towels are provided, and includes weekly cleaning. This is a brand new building, which is fully furnished to the highest level and includes everything you will need to make your stay an unforgettable experience. 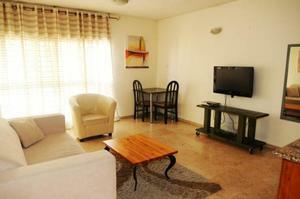 "The Apartments are on a excellent location ,on one of Tel Aviv's most happening streets.This pl..."